You’ve got to love this Christmas classic, and if you plant them in October they should flower eight weeks later…in time for the festive season! 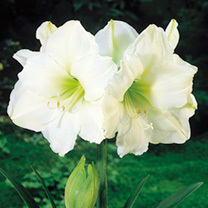 Our selection of Amaryllis bulbs has been specially prepared to put on an outstanding show in your home. Simply plant them up in some of your favourite planters and in a matter of weeks, when they come into bud, be ready to move them into pride of place. 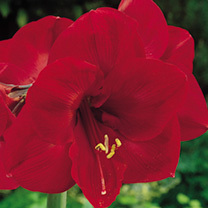 Our Amaryllis bulbs are extra-large, so you can look forward to beautiful flowers that add a touch of winter colour to your home. Your plant should flower year after year, giving you a splash of colour in your home during winter and spring. Choose from red, apple blossom, Gervase and white, and if you can’t quite decide you can choose any two for just £20. 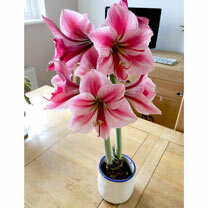 For even more colour, create your very own amaryllis garden in a pot, with the multi-stemmed variety (Red Garden). 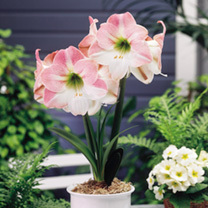 There’s something magical about enjoying the beauty of a brightly coloured flower in your living space during winter, and our gorgeous amaryllis bulbs make it easy.